In the last post we saw how ignorant George Will is about global warming and its consequences — yet nonetheless Will is willing to spew his ignorance in order to influence public policy. We showed quite clearly, with no ambiguity, that when it comes to wildfire in the U.S. the heat is rising. This is especially true in the western states, as we’ve looked at in detail before. George Will is wrong — willfully wrong — to imply with an offhand and cherry-picked statistic that wildfire is not on the increase in the U.S. But he wasn’t just wrong about wildfires. He was also wrong — willfully wrong — to suggest that old, tired canard, so often trotted out when the real consequences of global warming are laid bare, that even if there is a problem (like increasing wildfire) it’s not because of climate change. I pointed out that the actual science links increasing U.S. wildfire to global warming. One reader expressed a desire to see how wildfire activity relates to temperature. Let’s go one better. Let’s take each of the 11 western states reported about here and model the number of fires over 1,000 acres as a function of temperature. We’ll use monthly temperature data from NCDC for each individual state. 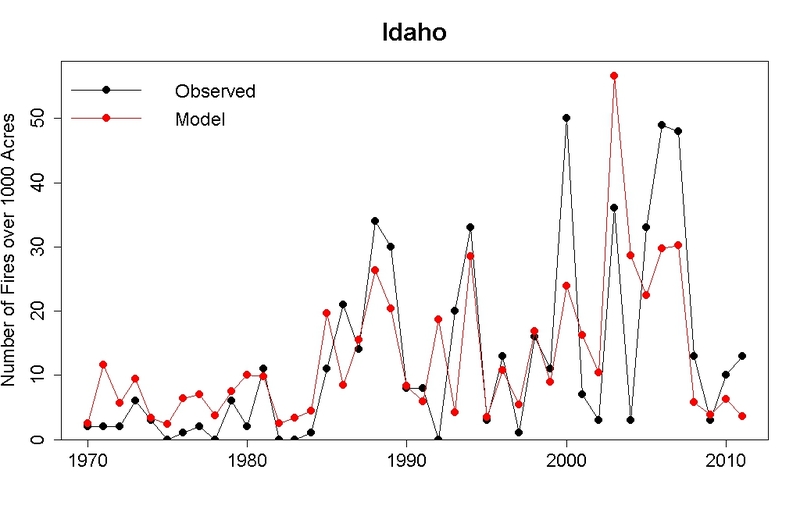 Then we’ll fit the annual number of fires over 1,000 acres to that year’s monthly temperature anomalies, using Poisson regression (which is the right choice since the target variable is counts). We expect that if Westerling et al. are right, the dominant influence should be from hot conditions in Summer, which makes the peak of fire season hotter, and in Spring, which causes earlier snowmelt and increases the chance of dry conditions later in the year. The statistical significance is … how shall one say? … perhaps the appropriate scientific term is “through the roof.” Yes, the number of large fires in Wyoming really does depend on temperature. Examination of the model coefficients shows that in this state at least, the real influence is from temperature during June, July, and August. 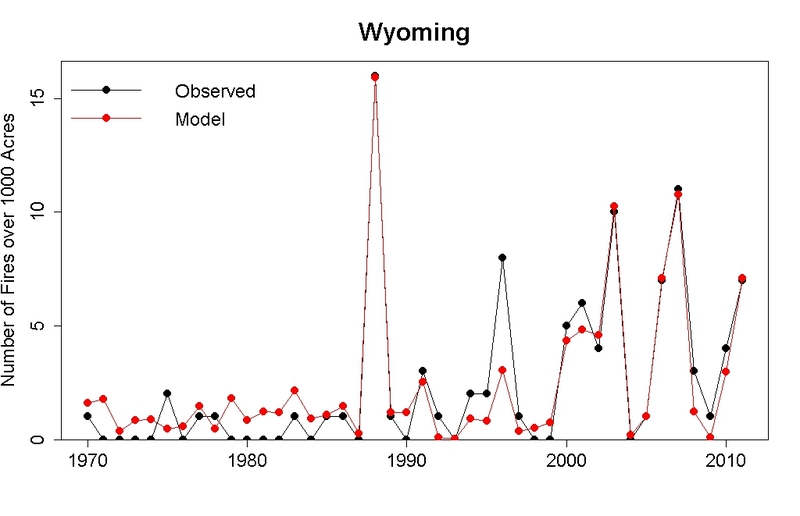 Hotter summer means more large wildfires in Wyoming. 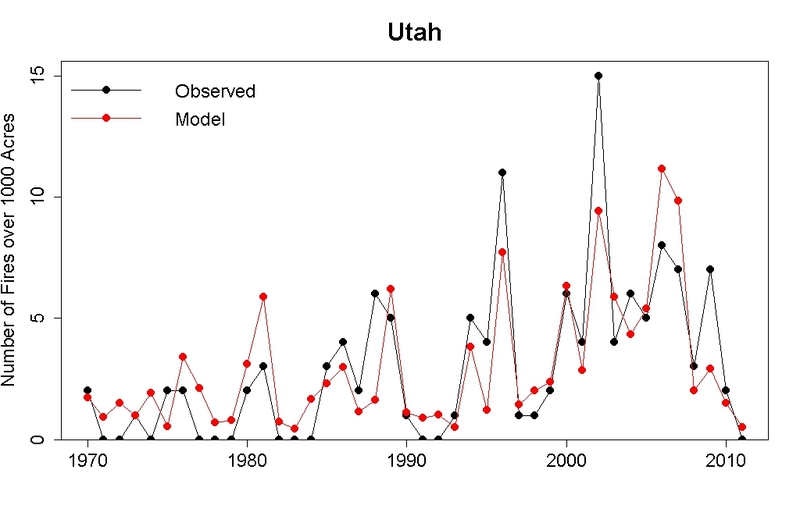 It’s not just that western states’ fire data are so well accounted for by temperature data. 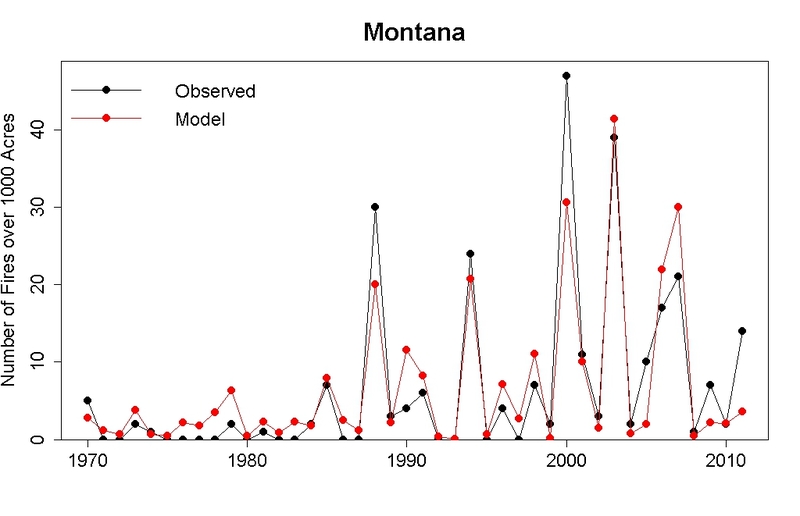 It is also noteworthy that certain months have a consistently strong impact, and that those which most strongly correlate with wildfire activity are exactly the months expected to do so. The strongest overall is temperature in July, closely followed by August, with June a weaker third but still significant. This bears out the hypothesis that hotter summer temperature leads directly to enhanced threat of wildfire. Also showing strong impact is warm temperature in April, which bears out the hypothesis that hotter spring temperature also enhances wildfire risk, probably by quickening snowmelt thereby leading to drier conditions later in the year. One odd result is that February temperature is sometimes anti-correlated with the number of wildfires. Perhaps warmer Februaries also have more precipitation, reducing wildfire risk by making conditions wetter later during the year — but I haven’t looked at the relationship with precipitation and I don’t know enough about fire risk to suggest this explanation with confidence. But some things I can say with confidence. Wildfire risk is on the increase in the U.S., especially in western states. Warmer temperature is certainly part of the reason, probably most of it. Hotter summer and hotter April seem to be the dominant factors. George Will is wrong about wildfire risk in the U.S. Willfully wrong. Having posted about his utter folly twice in a row, I hope his “ears are burning.” Because that’s not all. The cause of wildfire is a major policy issue in the West. If the trees killed by bark beetles are a cause of increased fires, then the forest “managers” are justified in “thinning” the forest to remove the “hazard” caused by the dead trees. This logic, compelling as it seems, is incorrect. A very thorough recent analysis shows that the increase in fires in the West is not caused by beetle killed dead trees; both the beetle kill and the fires are caused by a warming climate and are not a cause of each other. Citations follow. George Will will likely never acknowledge the above because it is counter to the story peddled by those who make money removing trees (alive or dead) from public land. I’ve seen quite a few papers with similar findings over the last couple of years. One more is no surprise, how many times do we have to be told that the effects of climate change on western forests will be catastrophic? OT, I entered “Lovelock” into the search box and it returned no results. Strange, because Lovelock is the “father of global warming” and his pronouncements both for and against the cause should be reported and discussed. All perturbations and feedbacks lead to greater understanding of the Gaia model. I typed “oldfossil + global warming” into Google and opened a treasure trove of denial dating back years. Quelle surprise! Ya *gotta* love the Googlebox, eh?…;) I recognized oldfossil’s “style” right off the bat. *The troll-stink is strong, Grasshopper. I was a ware of Will as a conservative columnist, writing mainly about economic issues. Before I even read the post, it was clear that he was a denier. Climate Central did a fairly detailed report this past fall, even as the 2012 fire season was not winding down, http://www.climatecentral.org/news/report-the-age-of-western-wildfires-14873 which backs up your post. Others are doing extensive work as well, http://web.cals.uidaho.edu/northernrockies/ and the conclusions are always the same: longer hotter summers and more acreage burned. If George Will had spent two months in the smoke as we did in Western Montana, he might think differently, but somehow I doubt it. Yeah, the smoke this summer really sucked. Of course the dry winter is going to lead to another bad fire season. I suppose it is the punishment for a few years of relatively low fire activity. Even an early wet spring followed by a hot dry summer can lead to worse fire conditions in areas like sage steppe which now almost universally sports cheatgrass as ground cover. Cheatgrass alone has changed fire frequency and other characteristics. I *hate* cheat grass: I go on a ‘search and destroy’ mission all summer long to eradicate it on my acreage. Hateful lil plant, it is! 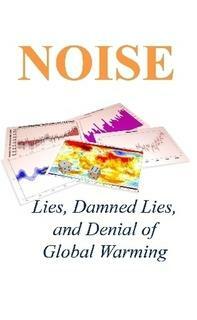 The number of fires won’t always increase just as there won’t be an increase in the amount of melting ice. Fires reduce the stock of things to burn. Maybe so, but there is a huge quantity of biomass available to burn in the woods. By comparison, we’re far closer to an ice-free Arctic than we are to a biomass-free (former) forest. Once you remove a fire-resistant ecosystem, by promoting fires (as by putting out all the fires for 40 years until the next fire is devastating), then you get a fire-promoting ecosystem that thrives by burning frequently — you end up with cheatgrass, medusahead, lots of openings, lots of brush and fire-dependent species like knobcone pine. And this connects with Arctic amplification–or could, at least, if Jason Box’s idea is right. The “Dark Snow project” has, I think, been linked here already; they are trying to crowdsource funding to determine the sources of the dimming of the GIS observed over several years. Dr. Box’s idea is that Northern hemisphere fires may be depositing soot, which would of course reduce albedo and promote melt. If so, then the increase in wildfire consequent to warming leads in turn to more absorbed solar energy, less melt and eventually more warming: a feedback loop. A positive one, by sign, but a very negative one by practical significance. Elegant analysis, and highly persuasive graphics! Would you be willing to share the fire counts you digitized for Oregon? Several colleagues and I have an interdisciplinary research project in NE Oregon, where wildfires are a concern. It would be interesting for us to fit a similar Poisson model, and experiment with some variants, for that state. The rest of the boreal forest fared no better in the summer of 2012: Siberia forest fires. ROFLMAO, Horatio! That was one of my favorites as a teenager. I love it. This post tweaked my curiosity to compare Canadian forest fire trends against your experience in the US. Canadian Wildland Fire Information System, cwfis.cfs.nrcan.gc.ca, the statistics shown do not track the lower 48, we have our dry years and wet years but no upward trend in either number of fires or hectares consumed. Any thoughts on this anomaly? Or do we not know how to count. [Response: You surely know how to be snarky.